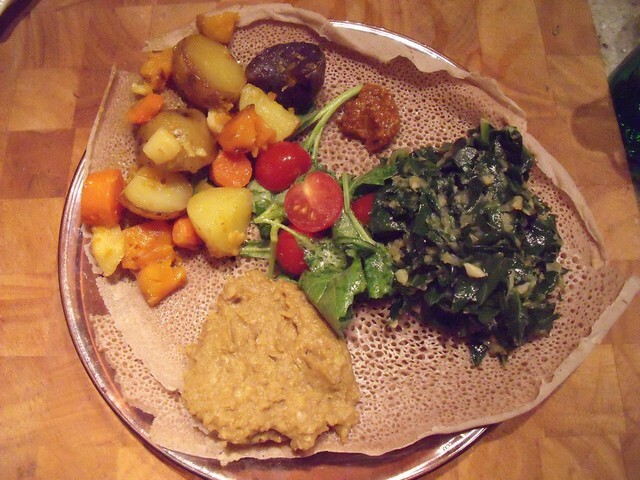 I have been dying to show you my Ethiopian dinner. And now that you have the base recipes for Niter Kibbeh and Berbere Paste, you can make your own Ethiopian dinners too! My favourite on the platter above (which was also the boyfriend’s top choice) is the collard green stew — ye’abesha gomen, which is a mild collard green stew. Traditionally, Ethiopian stews are served on a sourdough flatbread called injera that is full of little bubbles. You can make your own, and Papa Tofu Loves Ethiopian Food even has a gluten-free and vegan recipe! 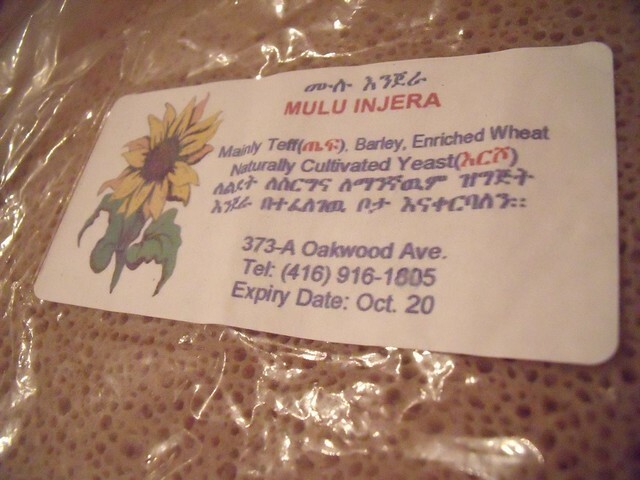 But I thought I’d spend the time on my stews instead, and also support my local corner store, which sells a package of teff & barley injera that would feed 4-6 people for $4. You can’t go wrong with that. And then when you’re done you get to eat your “plate” — the base of injera that’s been sopping up all the delicious spicy Ethiopian juices from your stews. YUM. And coming soon… the rest of the deliciousness on this plate. Mmm. This is my new favourite way to prepare any greens. You could also use it to prepare kale, or even chard! It would be a great side dish for any meal, or in my opinion, always the best part of any Ethiopian meal. Please note, Kittee has asked me to remove her recipes from my blog, and I am respectfully doing so. 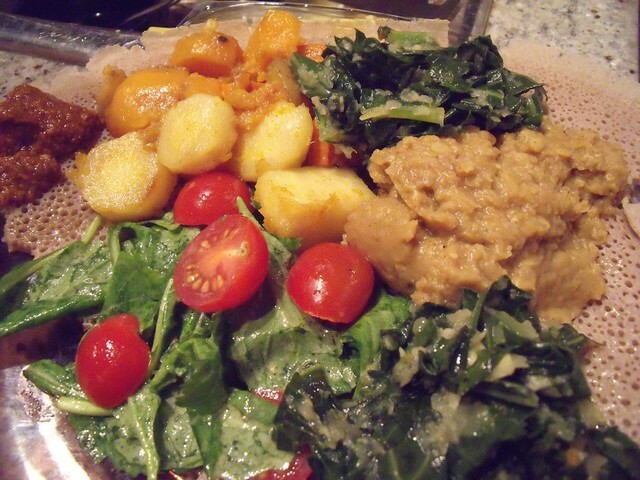 I adapted her ye’abesha gomen (mild collard greens) from Papa Tofu Loves Ethiopian Food. I love collards..or any green for that matter and these look delish! 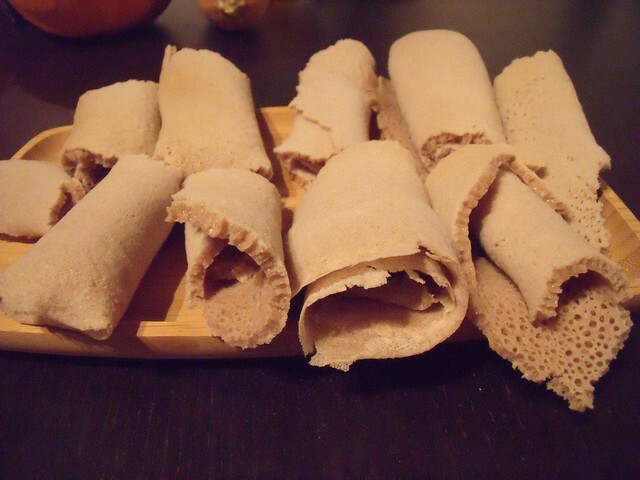 I haven’t tried injera yet, but have been itching to have a full Ethiopian meal. Me too — any kind of green makes me happy! This looks so good! I loooove Ethiopian food. There are a lot of great Ethiopian restaurants near me so I haven’t tried making much of it on my own. But this will be a great resource for when I do try. Thanks! 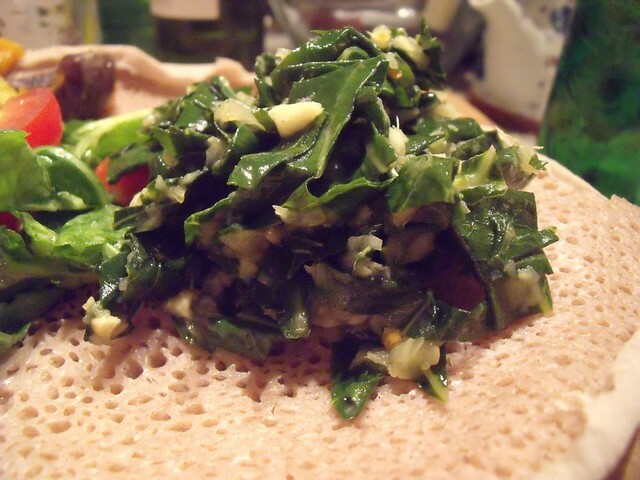 Those greens do look awesome & I love Injera too.